Deuteronomy 5:16 (NIV) - Honor your father and your mother, as the Lord your God has commanded you, so that you may live long and that it may go well with you in the land the Lord your God is giving you. Taking Care of Me: Where are my shoulders? 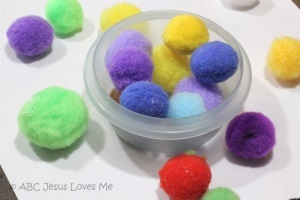 - ABC Book: Using the King worksheet, place a thin layer of glue on the paper. Add whole wheat macaroni to create a brown macaroni crown. 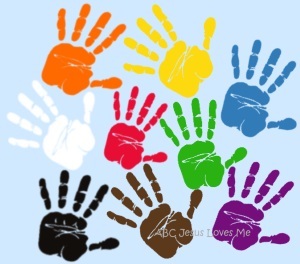 Handprint Wall - Add a brown handprint to your color wall by painting the child's hand and stamping it onto a piece of paper. Write the name of the color on the handprint. Display it at the child's level to point and discuss the colors. 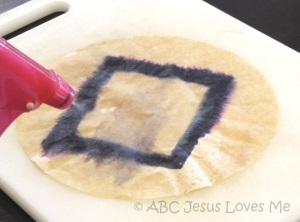 Coffee-Filter Shapes - Using a washable brown marker, draw a thick-lined diamond on a coffee filter. Spray water on the filter which will cause the ink to bleed. Let dry. - Using the Kangaroo worksheet, point to the kangaroo's shoulders. - Use words like jump, hop, joey (baby kangaroo), and pouch when talking about the kangaroo. - Find pictures of kangaroo in the books that you read. - Jump around the room like a kangaroo. - Point to yourself and then the child on "me and you." - Encourage the child to say the repetitive line "Just like me and you." Pick up bean bags and throw them into a large diamond drawn on the floor with painter's tape.